Below you’ll find the latest information and news about me and my site Noteboom Tutorials, including my latest tips and tutorials that I have available. In this lesson, from my upcoming tutorial on the Apple Watch, I look at the Control Center on the Apple Watch and the various controls we have for the Apple Watch. In this lesson, from my upcoming tutorial on the Apple Watch, I look at how to rearrange your Apple Watch faces on the Apple Watch using the Watch app on the iPhone. Learn how to manage your apps on the Apple Watch and the Watch app on the iPhone. This lesson is from my upcoming Tutor for Apple Watch with watchOS 5. 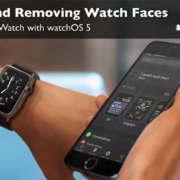 What you’ll learn in the lesson from my Tutor for Apple Watch with watchOS 5 is how the add and remove watch faces on the Apple Watch with the Apple Watch itself and with the Watch app on the iPhone. 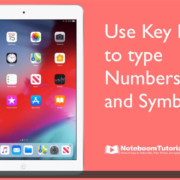 Did you know you could flick keys on the keyboard on your iPad to access numbers and symbols? To make sure this is enabled, open the Settings app and under General, go to Keyboard. Make sure Key Flicks is enabled. Now when you are using the keyboard and you want to type a number or symbol, instead of tapping the shift key before tapping the number or symbol, just flick down on the key to type it. What you’ll learn in the lesson from my Tutor for Apple Watch with watchOS 5 is how the change the style, color, and comlications on the Apple Watch and within the Watch app on the iPhone. In this lesson, you’ll learn the basics of getting around the Apple Watch including using the digital crown to view your apps, using the button to view recent/favorite apps, view your notifications, how to access the control center, use force touch, and more. What you’ll learn in this lesson from my upcoming Tutor for Apple Watch with watchOS 5 is how to show the Apple Watch apps in list view instead of icon view, how to make the text more readable by making it bold, and how to switch Watch Faces by swiping to the left or right on the Apple Watch. Are you wanting to set a different Homepage in Safari on your Mac? Just open Safari and go to the page you want as your Homepage. Open Safari’s Preferences and under the General tab, click on ‘Set as current Homepage’. Then set if you want new windows and new tabs to open to your Homepage you just set. Which watchOS am I using? See what I am working on before it is released. This video is from my upcoming Tutor for Apple Watch with watchOS 5. What you’ll learn in this teaser lesson from Tutor for Apple Watch with watchOS 5 is how to find out which watchOS you are using from the Apple Watch and how to find out which watchOS you are using from the Watch app on the iPhone. 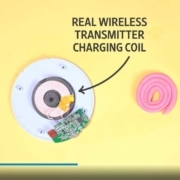 https://www.noteboomtutorials.com/wp-content/uploads/2019/04/010-which.jpg 507 900 Dan Wassink https://www.noteboomtutorials.com/wp-content/uploads/2014/12/nt-logo-white.png?_t=1533823527 Dan Wassink2019-04-08 09:15:042019-04-16 12:42:43Which watchOS am I using?